From its initial publication in 1943, the Artists Sketch Pad was a yearly institution in the calendar- publishing business. Originally created by Earl MacPherson for Brown & Bigelow, the calendars' format was adopted by most major pin-up publishers for almost twenty years. There were twelve one-sheet pages of pinups, spiral bound along the top of the calendar that featured a central image surrounded by a group of smaller ones. Around 1948, MacPherson hired an assistant named Jerry Thompson, an accomplished artist who wanted an opportunity to improve his pinups. When MacPherson was stricken with polio late in 1951, Thompson found himself with the responsibility of painting the yearly MacPherson Sketch Book for the Shaw-Barton calendar company. He handled this project until 1958, while also creating a similar calendar for the John Baumgarth Company of Melrose Park Illinois. One image from the Baumgarth calendar published in September 1952, was also sold as a single, one-sheet "hanger" calendar. Entitled Want to See Me Swing My Baton?, this image of a majorette was Thompson's most popular and one of the company's best money-makers. More than a million matchbooks with this picture were sold to advertisers who wanted their products or businesses associated with its all-American baton girl. 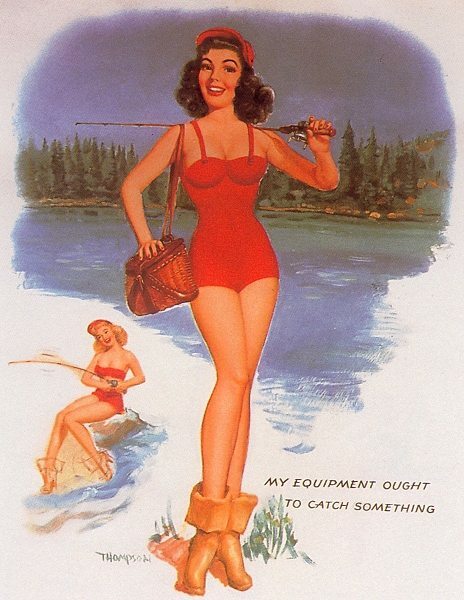 Thompson also had pinups published by the Kemper-Thomas calendar company. In 1950, he did a well-received series of advertising paintings for Dodge Trucks that featured scenes on a farm with horses and shiny new pickup trucks. Thompson painted both on canvas and illustration board. Unlike Earl MacPherson, he often combined mediums in the same painting, adding pastel, gouache, charcoal, and graphite to his oils. Only about half of his commercial pinups are signed. T N Thompson biography borrowed from The Great American Pin-Up by Charles G Martignette & Louis K Meisel. Title: Want to See Me Swing My Baton?